The total figure was just reported by Liz Lanier in Variety, based on estimates from Sensor Tower. However, Lanier's report only bundled the two mobile platforms together. That suggested that maybe iOS and Android were close to being on an equal footing for a game that has no ads, no In App Purchases, and a relatively steep price for a mobile game (it's $9.99 to unlock the entire game after the player finishes the initial levels of the free download). But that's not true at all. Sensor Tower itself reported that since the title launched about 77 percent of Nintendo's revenues have come from the App Store. It also stated that part of the reason for this was that it launched exclusive to iOS "six months earlier than on Google Play." But that's not correct either. 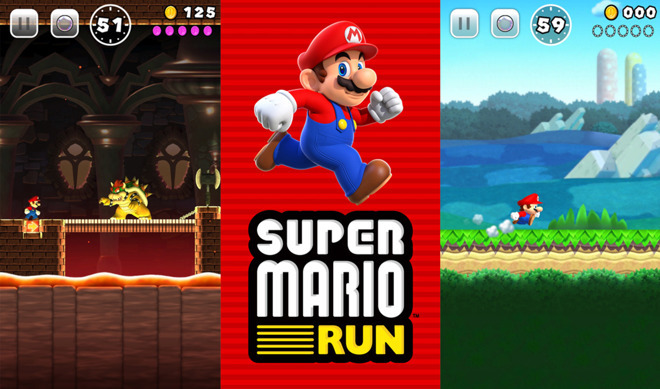 Nintendo unveiled the new title in September 7, 2016 at the iPhone 7 event, but it didn't actually become available in the App Store until December 15. Apple's ability to generate more money for developers (and itself) from apps, services and subscriptions on its iOS platform compared to Android is not an anomaly. Historically, the App Store has generated about twice the revenues from about half as many total users of Android. And there are many other platforms and services that appear to have more users (or at least a comparable base) than Apple, but generate far less in commercial results. Examples include Apple Pay versus Google Pay on Android, Apple Music versus Spotify, and Siri versus Alexa Echo—along with media fabrications that suggest Apple's iPad and Mac platforms are seriously challenged in some fashion by Google's tiny base of Chromebooks, or Microsoft's minor sales of Surface. In April, Sensor Tower reported that Apple's U.S. App Store customers drove significantly higher revenue per user ($58) than Google Play ($38). Randy Nelson, Sensor's head of mobile insights, stated, "we estimate that for each active Android device in the U.S. last year, approximately $38 was spent on Google Play-on and in apps-so about $20 less than iOS. "That tracks with the disparity in revenue generation we see between the stores outside the per-device level. Android users generally spend less on or in apps, Google Play generated about 60 percent of the App Store's revenue last year in the U.S."
For paid titles, and globally, where Google's platform is largely very low-end devices with users who pay little or nothing for services that are expensive in the U.S., and where advertising pays far less than it does in affluent countries, the disparity is even greater. Super Mario Run is an example of that.